It isn’t every day we are lucky enough to style a bride whose beautiful destination wedding ends up as a feature in Style Me Pretty! This wedding had everything from modern rustic décor to sweet romance to lots of laughter, and we feel most fortunate to have been a part of it all. 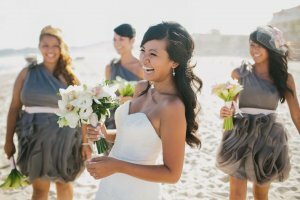 Gorgeous Filipina bride Jillian knew exactly what she wanted for her big day. 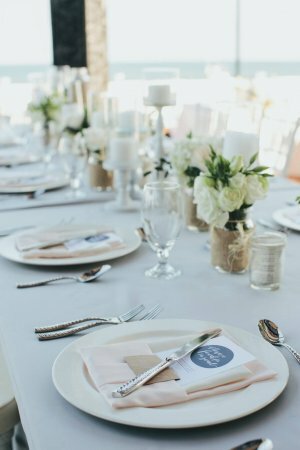 So we listened carefully to her vision of a romantic, clean style for her and her adorable wedding party. We kept Jillian’s eye make-up relatively light, using a pretty blush pink to match her dove gray and blush color palette. A touch of thin liner kept her look soft and allowed us to play up her eyes with thick-fringed lashes. A pop of peachy lip gloss was the finishing touch, and the color seemed completely suited to this bride’s fun, infectious smile. Jillian’s wedding hair was styled in a romantic half up-do with plenty of wavy curls that tied in perfectly with the custom rustic décor by Linens, Things and More. 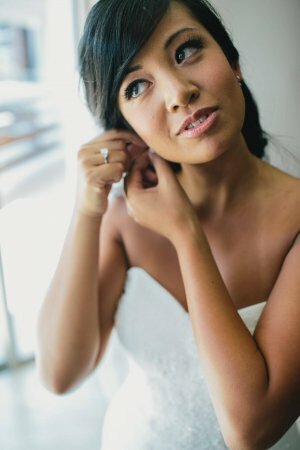 We gave her bridal party a similar fresh make-up look, keeping the focus on the eyes for the stunning photos by Spencer Combs and using a neutral lip that complemented the wedding colors. Their hairstyles were variations on the bride’s soft curls, but with a fun, sideswept twist. 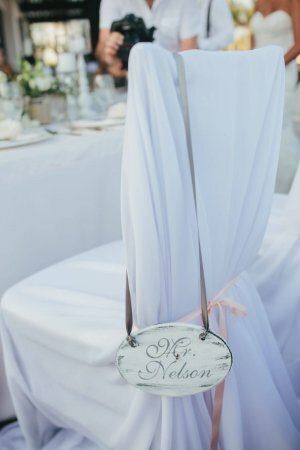 It’s obvious from the photos that this Cabo Azul wedding was worthy of its Style Me Pretty status! Despite all the pretty details, our favorite thing about this wedding was the genuine happiness and positive energy that radiated from Jillian and her lovely family! We wish you all the love and success in your future Jillian and Fred! This entry was posted in Blog and tagged Cabo Azul Resort, Linens Things and More, Spa Cabo, Style Me Pretty, Wedding hair and make-up Cabo. Exotic hair and make-up for Alison’s wedding at Sunset Da Mona Lisa!